Logitech is giving its Android tablet accessory line a welcome boost today by launching versions of its Ultrathin Keyboard Folio and Folio Protective Case for Samsung's Galaxy Tab 3 range. Both protectors are largely on par with their iPad counterparts, although there's varying levels of compatibility. The Ultrathin Keyboard Folio (shown above) is built solely for the Galaxy Tab 3 10.1, and centers on a Bluetooth keyboard that turns the tablet into a makeshift laptop. 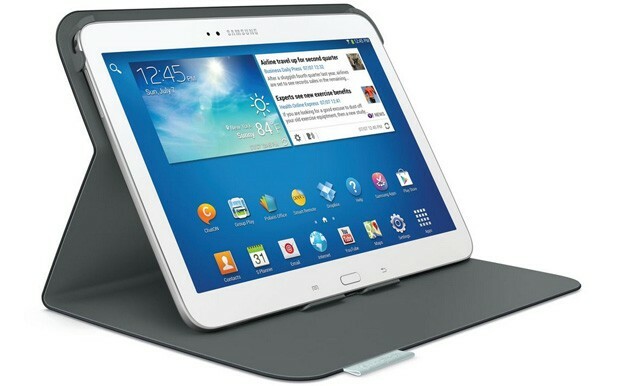 The Folio Protective Case (pictured after the break) drops the keyboard, but it's available for all three Galaxy Tab models. You'll find both cases in stores this October. The Folio Protective Case will cost $50 regardless of tablet size, while the Ultrathin Keyboard Folio will sell for $100.